Food is only available to adopters at this time. Sorry for any inconvenience. and more, that mice can't resist. 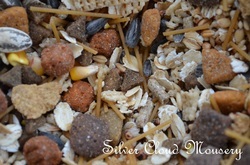 Mouse food mix is made to order for optimal freshness. Ingredients may vary slightly due to availability..